Play Cole is no hermit. There are Friends of Play Cole all over the world, with a heavy concentration in New York. FOPCs are a talented bunch and Play Cole is happy to show off the cool people he knows. Starring and written by Mike Drucker and Jon Clarke. With Alex Grubard and Billy the Kid. Starring RG Daniels, Kyle Masteller, Steve Dawson, and Jacqueline Holloway. Shot and edited by Jon Clarke. Directed and written by RG Daniels. 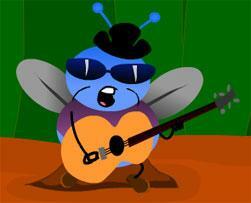 A bug sings a song that gets (tragically) cut short. Copyright 2006, 2007. All rights reserved.